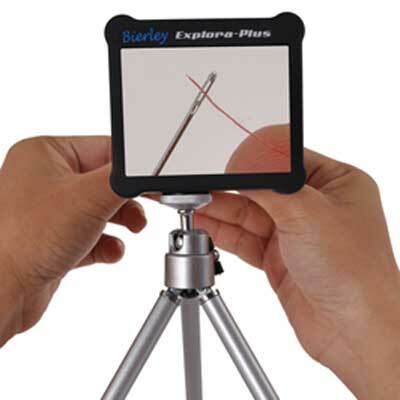 The Explora-Plus is a small portable electronic magnifier. It features a 3.5" non-glare, backlit TFT screen with smooth linear zoom from 4.5x to 9.0x magnification. A single button turns the unit on, controls the LED lights and turns the unit off. There are various modes available including full colour, MD with pure white text on a pure black background and enhanced positive with pure black text on a pure white background. Using the 'freeze' button, an image can easily be taken and held on screen to allow you to take a more detailed look. You can even display images on your TV. Included with theExplora-Plus are rechargeable batteries and charger, a tripod, acrylic stand, USB charger cable, wall socket charger and wrist straps.